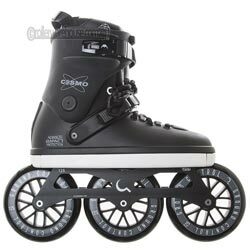 The Cosmo comes with Razors new Instant Frame Changing System (IFC) allowing you easily replace worn parts and convert your freeskate into a hockey or aggressive skate in seconds. The Cosmo liner utilizes a thinner padding for better boot feel and control. You’ll be able to strap in nice and tight using our heel-retention ratchet and aluminum cuff buckle. An aircraft grade aluminum frame and super high rebound 125mm/85A wheels serve up a smooth and effortless ride. The soul frame is the platform that’s holding the boot and frame together. It's made of a super tough, fiberglass-reinforced Nylon plastic increasing the stiffness and responsiveness of the skate. It also allows full transfer of power which is especially important when using bigger frames for recreation and speed. The one piece slider is made of tough, fiberglass-reinforced Nylon for superior strength, stiffness and durability. It also protects the outside of the boot and can be replaced in seconds if worn out.